Reverend Toller suffers from discomfort, the cause of which is unknown but feels grave, and when he experiences a bad spell he winces so his eyes look like the crosses on a dead cartoon character. This could just be Ethan Hawke’s face, or it could be one of the many religious images that have populated Paul Schrader’s career, which reads like a catalogue of tests for man’s spirit to endure. 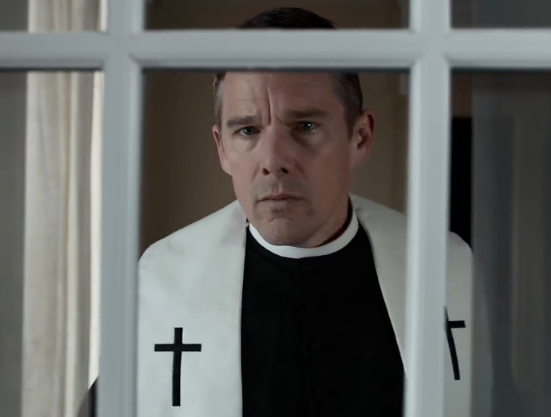 Toller dips his morning bread in a tumbler of whiskey (a reference to a filmmaker Schrader quotes continually) and preaches to mostly bare wooden benches in ‘First Reformed’, a quaint but crumbling clapboard church in Upstate New York. Since a tragic event that he feels responsible for, he has devoted himself entirely to preaching, but paradoxically his spirit is veering from the right path. Increasingly, of late, he is working himself up into a frenzy. The pain of his health and his conviction that humans have collectively neglected and abused the environment, and therefore neglected and abused God, gives him an unshakeable urge to tell people. The telling of his pain will manifest in violence. We have seen this character before. He is even paid homage to here, with a hypnotic zoom into a blob of Pepto-Bismol as it settles in a glass of whiskey. Travis Bickle stared at Alka-Seltzer fizzing in his water. Bickle, a creation Schrader wrote in a matter of days but has said was the product of long months of his own personal darkness, was similarly disgusted by what he saw and felt he could only make it known through an act of terror. It feels unfair, or at the very least poorly researched, to describe a man who has directed twenty one feature films as a writer. Whilst Schrader is more commonly known as the writer of Taxi Driver than the director of Mishima, or The Canyons, in First Reformed you can never be more sure that the writer’s vision has transcended into the filmmaker’s. The film is shot in the narrow 4:3 aspect ratio, admittedly now a trendy stylistic choice, but here it creates an oppressively sombre, restrained feeling. It is also Schrader’s coping mechanism for his preferred black-and-white being made unavailable by his distributor. Now the film has the elegant compositions of Carl Theodor Dreyer, if not his colour palette. There are no over the shoulder close-ups, traditionally used to anchor viewers in a sense of spatial reality between two people, and instead there is a sense of souls detached from each other, drifting and hoping to find a connection. Fortunately, a note of humour pervades and offsets what could have been relentless. Toller’s First Reformed lives in the gargantuan shadow of the nearby 3000 seater evangelical building, aptly named Abundant Life, run by the entrepreneurial and no-nonsense Pastor Jeffers (Cedric the Entertainer). The place shines with money rather than glowing from the word of God, although this is not a self-righteous point of the film, as there is also a running joke that Toller’s church serves more as a tourist destination than a place of worship. When a teenager walks unassumingly down the steps wearing a First Reformed baseball cap, we feel it would be appreciated by another American writer who was influenced by religion but had a complicated relationship to it, Flannery O’Connor. Schrader has spent most of his career in the expressionist mode, but directs First Reformed in the austere, spiritual style that he identifies with in Bresson, and in 1976 he felt he was not yet ready for. To do this in 2018 requires great faith, both in himself and the audiences. For Reverend Toller, despair is in how we have lain waste to our forests, oceans and skies whilst capitalists rub their hands together. From Mary he draws hope. For the last forty years, Schrader has also had to watch the thing he loves be disrespected and destroyed, but here he is, in what is supposed to be the twilight of his career, standing over the corpse of cinema, breathing new life into it.